Color Riche Nail Polish, the Revolution ! – Blog Mode Tendance et Lifestyle| Paris Beaauuu! Color Riche Nail Polish, the Revolution ! I hope you had a great sunny weekend. Beauty talking today with the greatest (and beautiful) discovery I made recently regarding the nail polish, it’s called Color Riche and it’s from L’Oreal! Tell me if I’m wrong but it seems to me that the launch announcement of these new nail polish was not well publicized. There was no big marketing campaign conducted around this new range of L’Oréal nail polish which I find yet revolutionary! I do not remember how I had knowledge of these new nail polishes from L’Oréal but I think that it was once in front of the products from the “Beauty” shelf from the Departement Store I read that it was ” new oil formula nail polish, a single coat is enough “. 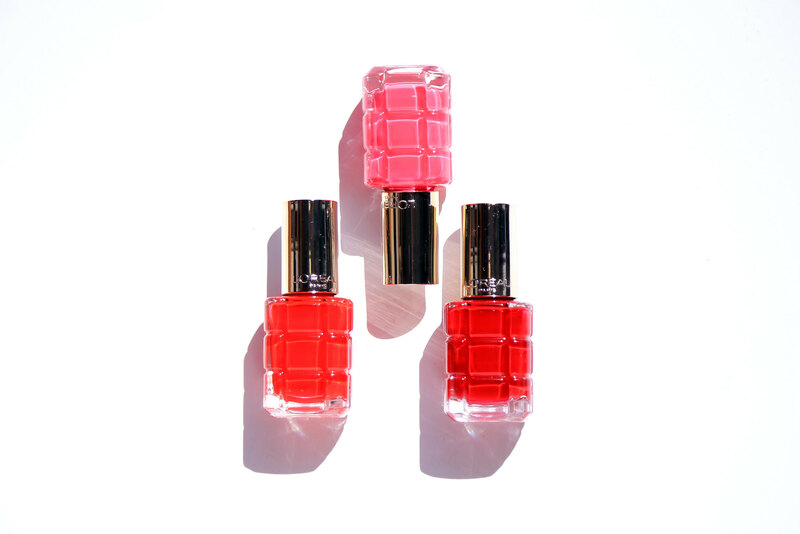 Curious and seduced by the chic packaging of these quilted bottles, I first bought the 554 Parisien Carmin Color Riche (a beautiful dark red) to test … Then completely conquered by the product, I purchased the 444 Orange Triomphe and 226 Nymphéa. Applied directly to the nail (without previously putting base) with its wide brush, the nail polish applies easily without (almost) make burr on the sides. Honestly, as well advertised in the description of Color Riche, one coat is enought but as I like my nail perfect, I apply a second layer. The nail polish dries in 5 to 10 minutes and has a high gloss finish. No need a Top Coat anymore and its holding lasts as long as Essie, to whom I was used.. I rarely had time to set half an hour to put my nail polish (base + two layers of nail polish + Top Coat), this new range of Color Riche nails polish has really changed my daily “Beauty nails” because of their efficiency which I can not do without, now. Then maybe you too will be conquered by these new Color Riche from L’Oreal? = ^ .. ^ = To mention, this post is not in partnership with L’Oréal. I had a big crush for this and my goal is to share and help you discover this beautiful “Beauty” innovation!